Appointed to fill a senate vacancy, Carter announced that she will resign as director of Baltimore’s Civil Rights office. But she may return as deputy director. Sen. Jill P. Carter, appointed to fill the seat of disgraced ex-senator Nathaniel T. Oaks, may continue working in Baltimore’s Civil Rights and Wage Enforcement office as a deputy director. 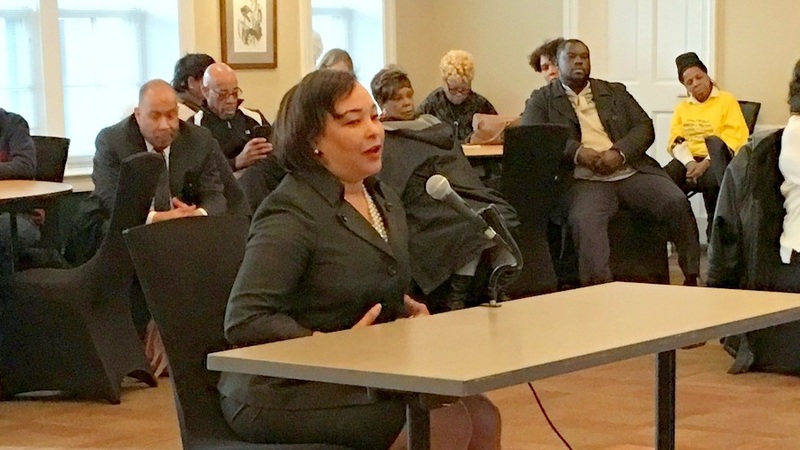 Carter has been serving as the office’s director since January 2017, appointed by incoming Mayor Catherine Pugh, herself a former state senator. Carter earned $121,400 annually at her city job, according to FY 2018 online records – or $19,400 more than that of her predecessor, Kisha A. Brown. Last month, Carter was tapped by Gov. Larry Hogan to fill the 41st District Senate vacancy through December 2018, a position that pays an annual salary of $50,330. At the same time, she is running for the senate seat, whose Democratic primary is June 26. Asked how much she will be paid in a deputy position, a spokesman for Mayor Catherine Pugh has not yet responded. The Civil Rights office was in the news earlier this week because of another personnel change. Charles G. Byrd Jr. Tuesday resigned his position as deputy director after the Baltimore Sun raised questions about his disbarment last year.